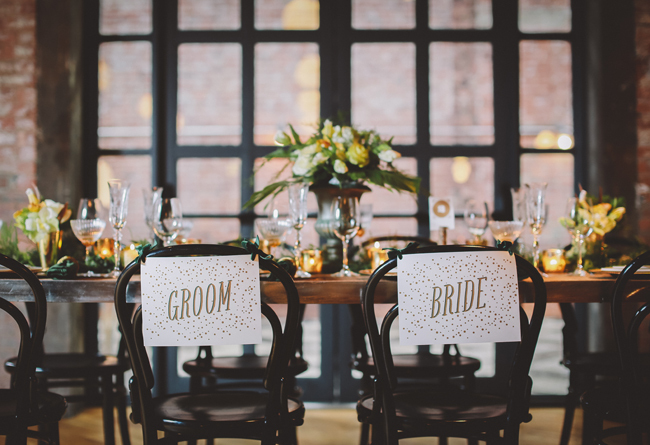 As many of you saw, this shoot was recently featured on GreenWeddingShoes blog! We were so honored and excited to be featured. However, with any great shoot and being published, not all the images make the final cut. A few weeks ago I shared a behind-the-scenes look into this shot, this week I will be sharing two more posts about the blog, with more lovely images and more information from each of our vendors about how we put this together.... Enjoy! When the team originally met, we were thinking of going with a 30's inspired route for the shoot. Tamra was blown away by the trailer for the new movie Oz and how it was 20's/30's inspired, so she presented the idea of using Oz as inspiration and luckily everyone was on board. Together, we pictured a shoot that was rich with glamour, but also had an organic feel with the flowers and decor to create living art. The goal was to create an illuminated experience, event - so we mixed shiny/ metallic golds with an abundance of greenery to bring each detail to life. Styling the clothing for the models was so much fun! As the accessories designer for the shoot, I had a lot of the head pieces and belts imagined and available to pull from her collection, many of them new pieces from her 2013 line which already has a 30's flair to it. I consulted with a good friend of mine, Rebecca, of Schone Design who makes modern wedding dresses with vintage inspiration. 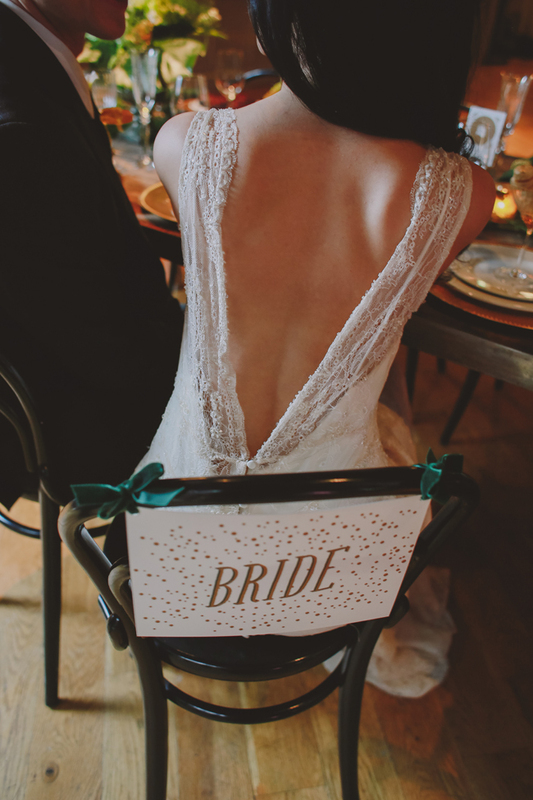 We choose a lace beaded number that was detailed without being over the top, along with a blush silk charmeuse gow that had a glorious low back - a true vintage staple. The last look was a flirty short number with a high lace neckline and luxorious silk velvet coat. For the male model, I knew we needed a top hat, no Oz theme shoot would be complete without one! The suit was a combo of pieces, tying in a classic grey suit jacket and skinny black tie, with a herringbone designed pant to give it that off beat vintage feel. For the paper goods, Patricia was inspired by the art deco vibe of the movie, from the Emerald City buildings to the gleams of gold and green throughout the scenes. Using that palette, she created a paper concept with luxe touches, such as a gold liner, patterned wallpaper backing, and touches of velvet, while keeping the design simple and clean. Gabrielle, our florist and props designer imagined what a dinner on a magical forest floor would look like and based the design for the table and floral centerpieces on that. 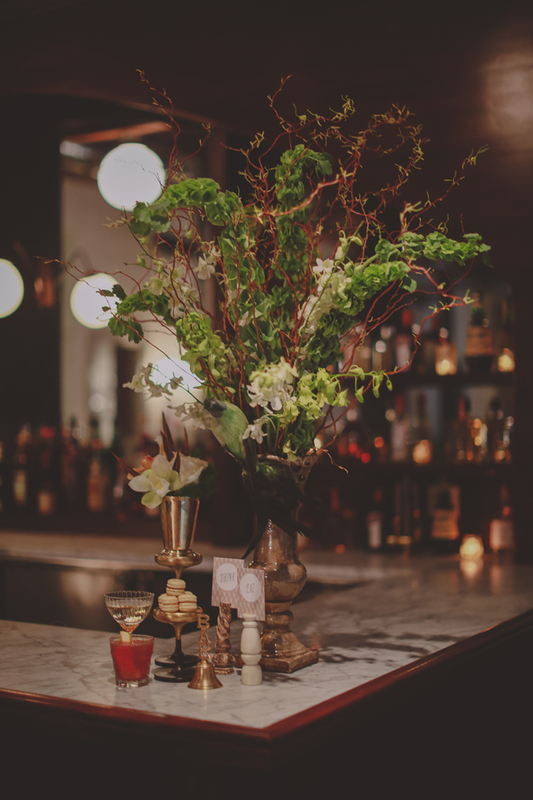 The table was set with a garland of lush ferns and greens upon which a large urn of curly willow and bells of ireland were mixed with some white orchids to add something more exotic. The look was completed by adding gold accents through the mercury glass candles placed down the length of the table and they shimmered like fire flies. Emerald napkins along with gold napkin rings and vintage glassware completed the look for this Oz inspired wedding shoot. One of our favorite parts was creating details like this hand made hot air balloon prop, a wicker basket spray painted gold, a hot air balloon and some gorgeous flowers - voila! An easy and fun prop/center piece. From Chellise, our photographer "I am a curious photographer. I like to play with shadows and light to create something more than an image. For this shoot in particular I wanted to preserve the deep rich gem tones and let the space of the hotel shine. And I love directing, so having this opportunity to have so much creative freedom was a real treat!". Stay tuned for part 3 later this week!